When people say “life’s a journey”, some take this aphorism more literally than others. Christopher Many embarked on an overland trip in 1997, believing he’d spend no more than a year or two on the road. Well, that didn’t quite work out as planned – 19 years have passed, and he’s still somewhere out there, doing what he loves most: circumnavigating the globe with vehicles of questionable reliability in a quest to understand, through first-hand experience, what makes humanity “tick”. 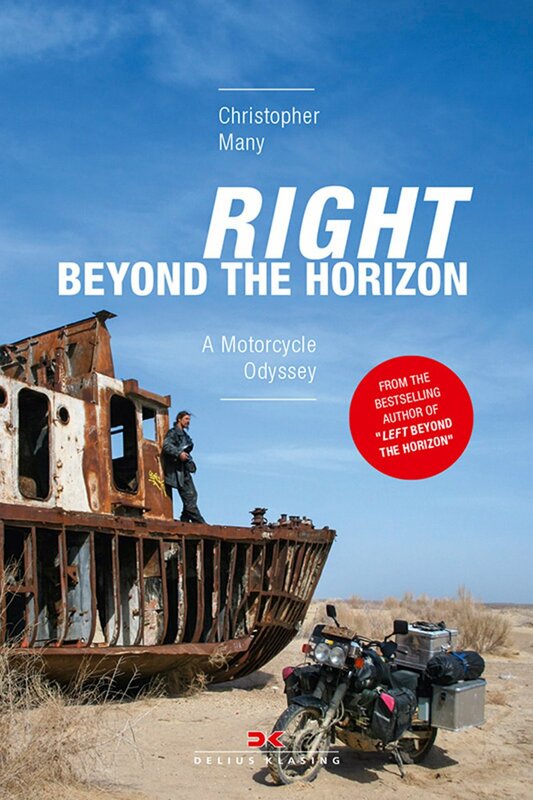 Right Beyond the Horizon tells the gripping tale of Christopher’s latest voyage between 2012 and 2016: a motorcycle adventure from Germany to Australia, together with his partner Laura Pattara, who had no previous experience on two wheels. Their modern-day odyssey follows the ancient Silk Road from Europe to Central Asia, then across the Pamir Mountains into China, where Christopher and Laura become the first overlanders with a foreign vehicle to obtain legal permission to transit the Middle Kingdom unescorted. Four years later they reach the harbour of Denpasar on the Indonesian island of Bali – the gateway to Australia and terminus of the classic trans-Asia overland route.